This peculiar disease is considered to be the most excruciatingly painful conditions known to man. Trigeminal neuralgia (TN) is considered by many to be among the most excruciatingly painful conditions known to mankind that causes a sudden, sharp and stabbing pain to one side of the face. The pain cannot be described in words and yet many sufferers express it by using their imagination as someone giving them an electric shock or blasting a bomb on their face. Since it is a chronic condition of acute, ‘out of the blue’ episodes of unbearable and agonising pain, countless people, out of sheer frustration have committed suicide before treatments (and cure) were discovered. That is the reason why it is also known as ‘The Suicide Disease’. An estimated one in 15,000 people suffers from trigeminal neuralgia, but in all likelihood, the numbers may be significantly higher due to frequent misdiagnoses. It usually develops after the age of 40 (though, it can also happen to children and younger adults) and affects more women than men, in perhaps 2:1 ratio. Since TN happens due to compression of the trigeminal nerve, which is one of our cranial nerves, by blood vessels, to understand the disease one must know a bit about what is a ‘nerve’ and ‘what is a cranial nerve’ for that one must glimpse into the world of our brain. Because understanding the basics of any disease gives us the power to seek the right doctors, discuss your problems, choose the treatment if there are options and finally cope with the entire process without fear and speculations. 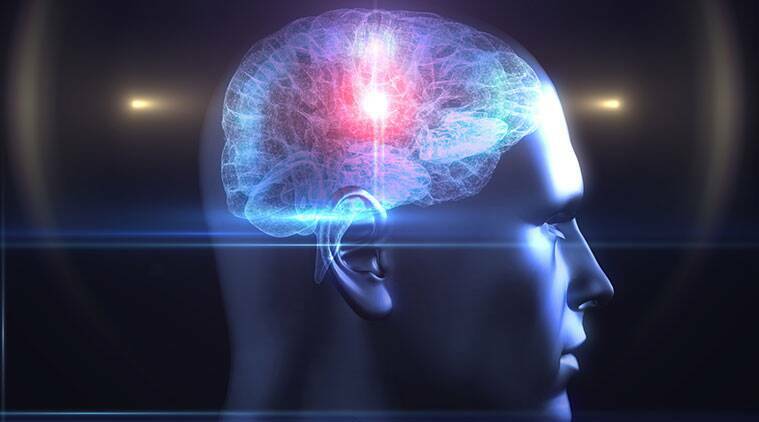 Understanding the human brain isn’t easy and even the most renowned philosophers, researchers as well as neurosurgeons are still at work to know more. But we do know that it gives us capacity to be artists, create, speak and write complex languages, pass moral judgements, harbour hate for generations and even die young for love. Most importantly, it stores memories, thus, making our lives memorable. Amazingly, as we go through our life, our brain even decodes the old memories in the light of new experiences and helps us find new meanings. I read somewhere that God created humans because HE wanted someone with ‘brains’ to admire the universe HE had created. As a woman columnist I would even argue why God is always referred as HE? And my questioning mind is also a part of my human brain. The human brain with its (literary) infinite ability is (figuratively) just a jellylike substance of fat and protein weighing less than one and half kilograms. It has 100 billion or 10,000 crore neurons (brain cells) forming an elaborate communication network, that not only puts together our mind and its thought process as well as highly coordinated physical actions but it also regulates involuntary processes, such as hormonal regulations, digestion and breathing. Neurons or the brain cells are a part of our central (brain) as well as the peripheral (periphery of the body) nervous system. It has a body cell and an axon (a long fibre that carries messages via electrical impulses). Unlike the neurone, nerves (that need to reach even the remote parts of our body) are a part of peripheral nervous system. They are made of bundles of axons. These bundles carry the messages to and from the brain from each and every cell, tissue, muscle and organ of our body, 24×7, every hour, every minute, every second and every millisecond. These axons are packed so carefully that one cannot but admire the Mother Nature. A typical nerve has fibrous axons protected by a tough outer covering. Since the messages travel as electrical impulses, insulation is vital to avoid short circuits that can spell disaster. Each axon within these bundles is further wrapped by a myelin sheath made of special insulating cells to keep the nervous impulses insulated. Most large nerves are mixed nerves, containing both motor (that carry messages from the brain to the body) and sensory (that carry messages from the body to the brain) nerve fibres running to and from a particular region of the body. Without the brain’s orders that are carried through these nerves we cannot as much flex the muscles of our toes. The trigeminal nerve is the largest and most complex of the 12 cranial nerves (CNs). CNs originate from brain stem (a part between the brain and the spinal cord) and play an important role in stretching of the jaw muscles, chewing, swallowing, heart rate deceleration and even all-important breathing. ‘CNs’ are also the communication network between the brain and the ears, eyes, nose, throat, tongue and skin on our face and scalp. The ‘trigeminal nerve’ is the fifth of twelve pairs of cranial nerves enervating (supplying nerves) the face and head, and has three divisions that enervate the forehead and eye, cheek and lower part of the face as well as the jaw. The trigeminal nerves function in sensing facial touch, pain and temperature, as well as controlling muscles used for chewing. 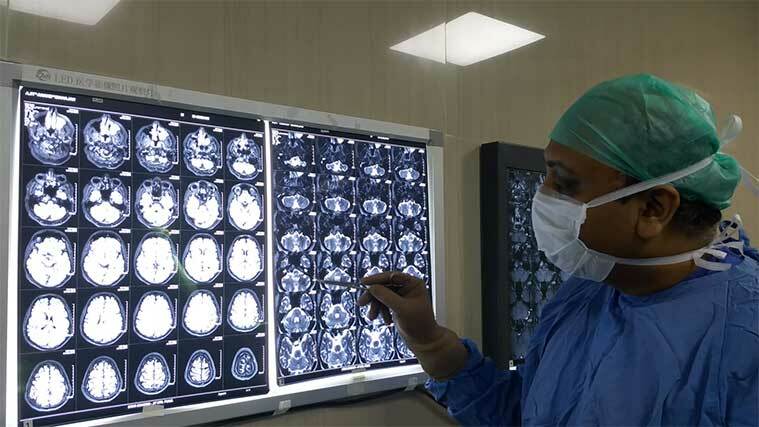 Let us ask some vital questions to Dr Jaydev Panchwagh, an eminent Neurosurgeon from Pune (Maharashtra) with special interest in treating Trigeminal Neuralgia. For the last 12 years it has been his mission to take brain & spine surgery to the masses. What are the reasons of TN? Dr JP: It happens when the trigeminal nerve is disturbed, compressed or for some reason loses its insulation. In most of the cases the problem is contact between a normal blood vessel and the trigeminal nerve at the base of our brain. This contact puts pressure on the nerve causing excruciating pain. TN can also occur as a result of ageing, or it can be related to multiple sclerosis or a similar disorder that damages the myelin sheath protecting certain nerves. In a few cases, trigeminal neuralgia can be caused by a tumour putting pressure on the trigeminal nerve. In other cases, brain lesions, brain abnormalities, surgical injuries, stroke or facial trauma may be responsible for trigeminal neuralgia. Can you tell us the symptoms? Dr JP: Episodes of severe, shooting or jabbing pain that may feel like an electric shock. These can be spontaneous or triggered by things such as touching the face, chewing, speaking and brushing teeth and may last from a few seconds to several minutes. Some patients experience constant aching, burning feeling that’s less severe than the spasm-like pain. The areas of pain are the areas supplied by the trigeminal nerve, including the cheek, jaw, teeth, gums, lips, or less often the eye and forehead. It is a pain affecting one side of the face at a time, though TN may rarely affect both sides of the face, it could be in one spot or spread in a wider pattern. Sometimes the attacks become more frequent and intense over time. Dr JP: There are three types of TN, the most common being the ‘Typical TN’. Most of the cases of typical TN are caused by blood vessels compressing the trigeminal nerve root as it enters the brain stem. Then there is ‘Atypical TN’ that is characterised by constant and severe aching, boring or burning pain over and above the otherwise sudden and acute pain of ‘Typical TN’. Then there is what is called the Pre-TN symptoms. Days to years before the first attack of TN pain, some sufferers experience odd sensations in the trigeminal distributions destined to become affected by TN. These odd sensations of pain, (such as a toothache) or discomfort like pins and needles. When the first attack of true TN occurs, it is very distinct from pre-TN symptoms. Does the pain happens all of a sudden or there are some triggers? Dr JP: Ha! That’s the tragedy of TN. A variety of triggers may set off the pain of trigeminal neuralgia, including simple daily chores like shaving, touching the face, eating, drinking, brushing the teeth, talking, washing the face and even life’s little pleasures like smiling, encountering cool breeze, and putting on makeup. This makes the patient very fearful, unsure and depressed. TN is also called ‘The Suicide Disease’. Is it true? Do the people want to end their lives? To cut the story short, he was suffering from severe TN which had started about six years back. He was having severe stabbing pain on the right side of his face which would be brought about merely by trying to open his mouth.